We never know how simple instances in life will unfurl. The start of Austin-based artist Psymbionic's new single featuring Chicagoan ProbCause goes back to his remix entry for "Satoshi Nakamoto" for Gramatik's 2016 Epigram. The beginning of this head-nodding tune has been years in the making where both gave the collectively creativity the time to unravel. 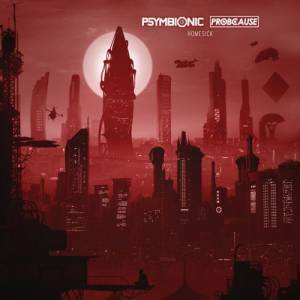 In the new single "Homesick", ProbCause spits a deep flow of personal facts placing lyrical imagery into seamless melodic context of Psymbionic's expansive experimental, bass-driven soundscape. Knowing how this track's had a bit of time to breathe, we witness that patience pays off. This project is something that resonates for those who live deep in the dynamic nature of being, namely touring artists, who discover how "home" is more than just a place. In a storm of collected experiences while on the road, ProbCause finds an impeccable home for his message. When Prob sent back the vocals, I was instantly in love with them. He gets 100% of the credit for the lyrical ideas throughout, but it's a topic that spoke to me really intensely: for artists, we often go through periods where we wish we were home while touring but wish we were touring while at home. The lyrics feel really personal to me even though I had no hand in writing them, it's just relatability at its essence. This tune stands out among many unique tunes in his upcoming album Carbon Based Lifeform due out February 5th on Psymbionic's label Gravitas Recordings.